The GIMP is the GNU Image Manipulation Program. It is a freely distributed piece of software suitable for such tasks as photo retouching, image composition and image authoring. Still an EXCELLENT photo editor. As a former graphics designer, GIMP has most everything that Photoshop has and you don't have to spend a fortune. Beware !!! There are some suggesting that you use Krita instead, even calling those who stand by GIMP, Morons. Comparing Krita and GIMP is like comparing apples to oranges, and while Krita is an excellent drawing program, it lacks the functions needed for advanced image editing. I stand with the GIMP. 5 Stars !!! Keeps getting better with each version. 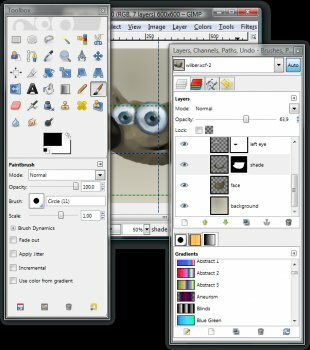 lol morons saying kritas interface is unconventional when it looks EXACTLY like photoshop, meanwhile gimp looks like it was make in 1972. And yes Krita does painting very well, but that does NOT mean it doesn't ALSO do photo manipulation, it does, and it does it BETTER than gimp ever will. As a former graphics designer, I see no need to fork out $$$ for Photoshop, and make Adobe lots of money. GIMP has practically all of the features of Photoshop and it's developers don't just rush releases out the door. The magnetic scissors tool is a masterpiece. Great Program!! and best of all it's FREE !! I've tried Krita, and quite frankly, it's unconventional interface just doesn't cut it. Krita is a digital painting application, Gimp is a generic image editor. Both programs have entirely different uses. I'd never use Krita to do any sort of basic picture manipulation. I hate to say it, but GIMP is done. Krita came along and did everything the community had been asking GIMP to do for decades. Ive switch to Krita, it even replaced photoshop for me. Goodbye GIMP, you missed the boat and its over. Has become slow and utter garbage. Bottom Line: Still an EXCELLENT photo editor. As a former graphics designer, GIMP has most everything that Photoshop has and you don't have to spend a fortune. Pros: Great Photo Manipulation program. Bottom Line: Keeps getting better with each version. Bottom Line: lol morons saying kritas interface is unconventional when it looks EXACTLY like photoshop, meanwhile gimp looks like it was make in 1972. And yes Krita does painting very well, but that does NOT mean it doesn't ALSO do photo manipulation, it does, and it does it BETTER than gimp ever will. My most pleasant surprise. Truly nice work, and to get that free. Thanks a lot for the developer. Fully compatible with all of my PCs, on 3 different OS and language platforms, works without incidents. Very effective, great for demanding works. Needs some learning but not too difficult to use, give very nice result. Took an online course through lynda.com for this. Downloaded three plugins and it out performs Adobe IMHO. I wish that they would update the Linux version though.